Welcome today's stop on the Cinderella, Necromancer by F. M Boughan Blog Tour presented by Month9Books and hosted by Chapter by Chapter. Today's stop is a review as well as a chance to enter the great giveaway that is being run throughout this tour. I am a sucker for fairy tale retellings especially the darker ones and this one is darker than most which is part of the fun. I really liked the different take on the Cinderella tale that this story took. 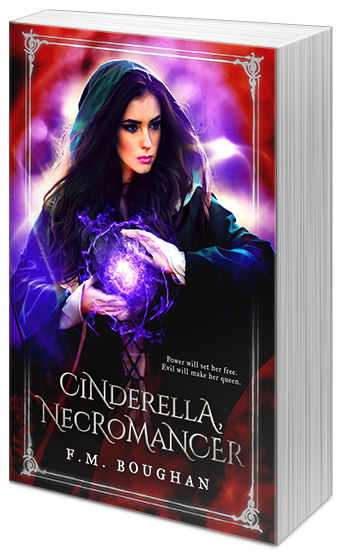 It kept the essential elements of the Cinderella story but cleverly wove the necromancy idea around this tale. I liked the fact that there was no fairy godmother, that Ella after finding the grimoire in her father's office, used it to get herself to the ball. I also was intrigued about the fact that the grimoire was based on a real grimoire from the 15th century. Ella herself was strong and loyal to her family and I think this shone through the tale well. I also liked the author's take on the other characters in the tale and the way it fitted with what we know of the characters from the original tale. Whilst there seemed quite a bit to set up at the beginning , the tale itself flowed well and kept me reading till the last page. If you like your tales more brothers grimm than Disney, then this is the book for you.